Beginning on Aug. 1, United Airlines will offer amenity kits from Cowshed Spa, the premium spa and lifestyle brand of London-based Soho House & Co., to in-flight customers and those in airport lounges. All Cowshed products are made in England from organic, wild-grown and fairly traded plant extracts and essential oils, allowing customers to enjoy formulas inspired by the scents of an English country garden, with playful names designed to relax travelers. The new United Global First and United Business First amenity kits will be available on long-haul international flights to and from the United States. In addition to regular amenities such as socks, an eye mask and a toothbrush, the earth-tone kits will contain Cowshed’s moisturizing hand cream, Lippy Cow Natural Lip Balm and a Chamomile Refreshing Towelette. Customers on United Global First will also enjoy Cowshed’s Quinoa Hydrating Daily Moisturizer and Jasmine Toning Eye Balm. Meanwhile, premium cabin lavatories will be stocked with Cowshed’s Chamomile Refreshing Toner and Lavender Gentle Cleanser. 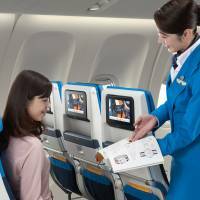 KLM has upgraded most of the B777-200 aircraft that serve its Fukuoka-Amsterdam route. The airline employed top Dutch designer Hella Jongerius to bring a new character and style to the cabin and to World Business Class seats. 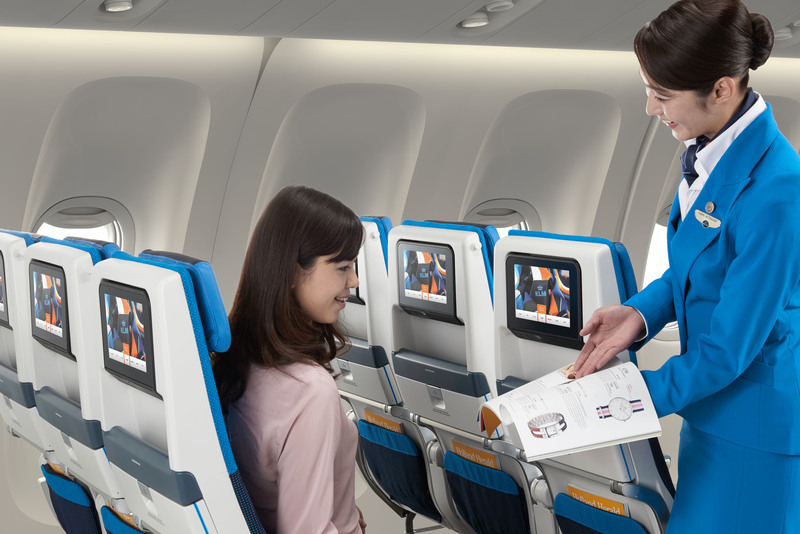 The 207-cm-long seats can be reclined until they are fully flat and have direct access to the aisle. “We had to take many technological aspects into account but KLM was very open toward making changes,” said Jongerius. The brand’s iconic blue color is mixed with deeper shades for the cabin seats and a storage space was added next to each seat to create more personal space. From the carpet and paneling to blankets and cushions, the new design prioritizes comfort and privacy for passengers. The color and materials used were specially chosen to provide a warm and homey atmosphere. The Dutch designer also addressed a key issue for the company, namely environmental impact, by using recycled carpet and parts of discarded KLM uniforms as materials. Scandinavian Airlines will be giving out Royal Copenhagen products to passengers who purchase a return ticket between Tokyo and Copenhagen through the company’s official website (www.flysas.co.jp) or Expedia (www.expedia.co.jp). The “Online Campaign” runs until Aug. 31 and is applicable to flights departing before Sept. 30. Eligible passengers will be presented with a White Fluted Mug by Royal Copenhagen, a porcelain products manufacturer that was founded in Copenhagen in 1775. Ranked second in 2014 in Flightstats’ On-time Performance Service Awards, SAS offers daily flights between the two countries. This promotion is currently valid on any flights between Japan and Copenhagen operated by SAS.